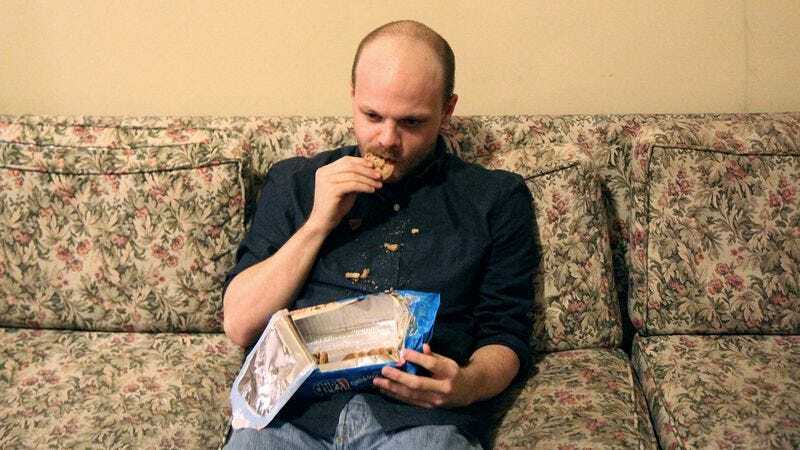 DURHAM, NC—Providing insight into the potential causes underlying the unhealthy behavior, a Duke University study released Wednesday has discovered a strong correlation between binge eating and feelings of stress, contentment, depression, joy, boredom, anger, and relaxation. “Our data indicate that a highly positive, negative, or completely neutral emotional state is associated with a drastic increase in the quantity of food a person will consume in a single sitting,” said the study’s lead author, Helen Ermel, who noted that feelings of anxiety, self-confidence, embarrassment, grief, relief, hostility, composure, envy, pity, pride, and regret were also found to be linked to overeating. “We observed that subjects are likely to eat twice or even three times as much as is considered healthy if they have a particularly heavy workload, if they have absolutely no work to do at all, if they are satisfied with the direction in which their career and relationships are going, if they feel their life is meaningless and all their efforts have thus far been useless, if they’ve had a long and mentally taxing day, if they’ve had a pleasant or rewarding experience, or if they just woke up. And these correlations appear to be extremely robust.” The study further found that people are most prone to overeat during lunch, breakfast, dinner, brunch, afternoon or late-night snacking, and dessert.